A man has been arrested after a haul of weapons - including three AK47 assault rifles and 22 grenades - was found during a police raid. The firearms were discovered by officers during a search of 70 shipping containers in Aveley, near South Ockendon, Essex, on Tuesday. Stolen vehicles, Class A drugs and a cannabis farm were also uncovered in other containers, police said. A 31-year-old man has been arrested on suspicion of firearms offences. 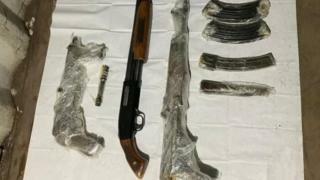 Two shotguns, a revolver, pistol and hundreds of rounds of ammunition were also uncovered in one of the containers during the raid, on an industrial estate in Romford Road. Det Ch Insp James Harper, from the Met, said: "I have no doubt that removing these weapons from circulation has prevented death or serious injury." Police later clarified the location of the find as an industrial estate near Bretts Farm, but said the farm and its owners had not been involved in the operation.